Put 10 accountants in a room and ask them to define cashflow forecasting and you’ll get maybe 5 different definitions. Then add 10 small business owners, and you’ll get another 5 suggestions. So, it’s fair to say that there are different needs and approaches when it comes to forecasting cashflow, especially when forecasting for a client. Sometimes, especially in times of crisis, the business need isn’t forecasting cashflow, but managing it. Short-term cashflow management is needed when you are considering ‘who is going to pay me before Friday?’, or ‘which suppliers can I pay this week?’. To answer these questions you need a short-term cashflow prediction of how the bank account balance is going to look next Friday. But, as soon as you have that prediction, you’ll make decisions that will make this prediction void. For example, based on this initial cashflow prediction you’ll make assumptions that a particular client will pay you next week and you’ll decide to pay (or not pay) some suppliers this week rather than next. Any of these decisions will render this short-term ‘forecast’ wrong, as your actions in response to this forecast will change what actually happens.. Does that make it a useless forecast? It gives you a guide as to what would happen given a particular set of assumptions. Armed with that knowledge from your initial short-term forecast, you then have the confidence to change your expected actions. So, short-term, daily or weekly forecasts can certainly be important and a useful tool for decision-making. But, short-term cashflow forecasts have a very short lifespan – and they’re only really useful to businesses with severe cashflow problems. What then, are the other accountants in the room looking for in a cashflow forecast? The gold standard is the 3-Way Forecast, where the forecasts for Profit & Loss, Balance Sheet and Cashflow are in perfect alignment. The net profit in the Profit & Loss forecast should equal the movement in the Current Earnings in the Balance Sheet forecast. The change in the bank balance in the Balance Sheet forecast should match the change in the Cashflow Forecast. Try doing this with a spreadsheet and you’ll soon end up with circular references in your formulas. Banks love 3-Way Forecasts and many require them as part of a loan application, and increasingly as part of ongoing loan covenants. It’s vital for any good accountant or bookkeeper to be able to produce a 3-Way forecast promptly when your client requires one. But how can a 3-Way Forecast be done quickly and easily for your clients? The first requirement to produce a 3-Way Forecast is good, up-to-date accounting information to form the foundation of your forecast. In the era of cloud accounting this is much easier than it used to be. You can now easily check that the bank has been reconciled and that outstanding debtors and creditors look sensible. Then, rather than using a laborious spreadsheet for your 3-Way Forecast, you link Calxa to your accounting data. Then all you have to do is, adjust a few settings, add in a budget and you’re done with your first draft 3-Way Forecast. Being able to get the first draft quickly means you can then have a useful and productive discussion with the client on fine-tuning the details. After connecting to the accounting system you’ll be prompted to select appropriate schedules for the timing of payments for GST/VAT, PAYG/PAYE and superannuation. You can adjust these timings and also modify the accounts that are nominated for each category later under ‘My Workspace, Settings’. . If your client doesn’t have a budget of their own yet (or there wasn’t one to import from the accounting system), use the Budget Factory to quickly create one. Base your budget on last year and add appropriate increases to Income, Cost of Sales and Expenses to get your first draft.You can alternatively choose the option to set the desired Net Profit and it will work out the revenue required for you. Then run the Cashflow Forecast report and chart, the Balance Sheet Forecast report and the Profit & Loss Projection to see your results. Add each of these to a Report Bundle so you can quickly re-generate the reports as you make changes. Every forecast requires a conversation with your client. They have to be comfortable with your assumptions and with the budget you’ve based it on. Once you’ve talked to them, it’s easy to then edit the budget figures. If there are lots of changes, or you need to do complex calculations, it is easy to simply export the budget to Excel, make your changes and re-import it. While our default settings for the timing of payments and receipts works well for most clients and for most account lines, you can over-ride them. We start from the average outstanding debtor days (or creditor days) in the accounting file and do some statistical analysis of this to estimate what gets received in the current month, next month and so on. There’ll be some expenses though, where you know the payment will always be made in the current month – just adjust the cashflow settings on this account to a Profile with 100% Current and you’re done. If your client (or their bank) will need these reports on a regular basis, put them in a bundle and all the settings will be remembered. You can then add a workflow to send an updated bundle to your client each month. You can also add in a couple of additional reports like ‘Where Did Our Money Go?’ to enable your client to look back at what’s happened to their cash. The 3-way forecast will give your client a full 360-degree view and they will know exactly where their business is headed. Discuss the results of their 3-way forecast with your clients on a monthly or quarterly basis and you’ll have an informed, educated client who appreciates your work. 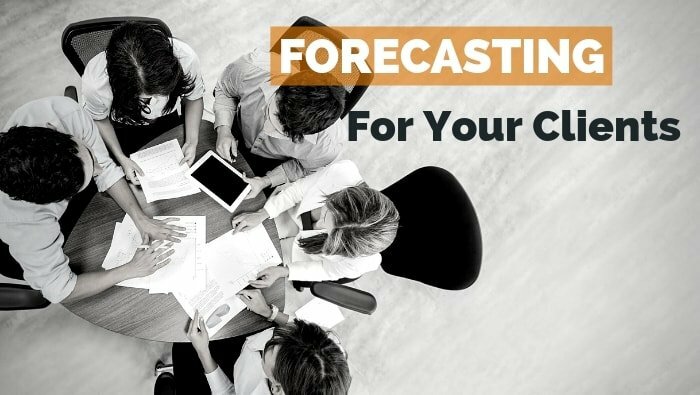 Armed with a 3-way forecast you’ll be able to help your client grow their business and they’ll reward you accordingly. Calxa saves time for Businesses, Not-For-Profits and Accountants by automating budgeting, cash flow forecasting and KPIs, intelligently.